While clerics are the special agents of their deities, exemplars are the special agents of those universal forces above even the gods — the four fundamental alignments. Each exemplar exemplifies the ideals of one aligned aspect — Law, Chaos, Good, or Evil. From this devotion to a universal force comes an exemplar’s power to bring wrath down upon those of opposing ideals. An exemplar may pay homage to a particular god who well matches her alignment and personality, and indeed certain exemplar abilities require the use of a symbolic object which may also be a holy symbol. However, an exemplar’s power comes from her ideals rather than any deific patron, and her ‘holy symbol’ may simply be a personal charm which reminds her of the ideals she strives for. The exemplar’s class skills are Craft (Int), Diplomacy (Cha), Handle Animal (Cha), Heal (Wis), Knowledge (nobility) (Int), Knowledge (religion) (Int), Profession (Wis), Ride (Dex), Sense Motive (Wis), and Spellcraft (Int). All of the following are class features of the exemplar. Exemplars are proficient with all simple and martial weapons, with all types of armor (heavy, medium, and light), and with shields (except tower shields). At character creation, an exemplar chooses one of the four aligned aspects to exemplify: Chaos, Law, Good, or Evil. This choice is known as her exemplified aspect, and affects many exemplar class abilities. The aligned aspect opposed to an exemplar’s exemplified aspect is known as her opposing aspect, and affects many exemplar class abilities. Chaos is opposed to Law, and vice versa. Good is opposed to Evil, and vice versa. True neutral exemplars are an exception to the above. A true neutral exemplar exemplifies a specific alignment, and opposes the four specific alignments which she considers to be dangerously extreme. Such an exemplar’s exemplified aspect is of course the true neutral alignment, while her opposed aspects are the chaotic evil, chaotic good, lawful evil, and lawful good alignments. An exemplar has a particularly powerful aura corresponding to her exemplified aspect (see detect evil for details). At will, an exemplar can use detect [opposing aspect], as the spell. An exemplar can, as a move action, concentrate on a single item or individual within 60 feet and determine if it possesses her opposing aspect, learning the strength of its aura as if having studied it for 3 rounds. While focusing on one individual or object, the exemplar does not detect her opposing aspect in any other object or individual within range. Once per day, an exemplar can call out to her exemplified aspect to aid her in her struggle against her opposing aspect. As a swift action, the exemplar chooses one target within sight to smite. If this target possesses her opposing aspect, the exemplar adds her Cha bonus (if any) to her attack rolls and adds her exemplar level to all damage rolls made against the target of her smite. If the target of smite is an outsider, a dragon, or an undead creature that possesses her opposing aspect, the bonus to damage on the first successful attack increases to 2 points of damage per level the exemplar possesses. Regardless of the target, smite attacks automatically bypass any DR the creature might possess. In addition, while smite is in effect, the exemplar gains a deflection bonus equal to her Charisma modifier (if any) to her AC against attacks made by the target of the smite. If the exemplar targets a creature that does not possesses her opposing aspect, the smite is wasted with no effect. The smite effect remains until the target of the smite is dead or the next time the exemplar rests and regains her uses of this ability. At 4th level, and at every three levels thereafter, the exemplar may smite one additional time per day, as indicated on Table: Exemplar, to a maximum of seven times per day at 19th level. At 2nd level, an exemplar gains a bonus equal to her Charisma bonus (if any) on all Saving Throws. At 2nd level, an exemplar gains the power to either lay on hands or slay with hands. Exemplars with the Good exemplified aspect lay on hands; exemplars with the Evil exemplified aspect slay with hands; exemplars with the Chaos or the Law exemplified aspects must choose whether to lay on hands or to slay with hands. Once made, this decision is permanent. Lay on Hands: An exemplar with this ability can heal wounds (her own or those of others) by touch. Each day she can use this ability a number of times equal to 1/2 her exemplar level plus her Charisma modifier. With one use of this ability, an exemplar can heal 1d6 hit points of damage for every two exemplar levels she possesses. Using this ability is a standard action, unless the exemplar targets herself, in which case it is a swift action. Despite the name of this ability, an exemplar only needs one free hand to use this ability. Alternatively, an exemplar can use this healing power to deal damage to undead creatures, dealing 1d6 points of damage for every two levels the exemplar possesses. Using lay on hands in this way requires a successful melee touch attack and doesn’t provoke an attack of opportunity. Undead do not receive a saving throw against this damage. Slay with Hands: An exemplar with this ability can do just the inverse; she deals damage to living creatures as an exemplar with lay on hands deals damage to undead creatures, and she heals undead creatures as an exemplar with lay on hands heals living creatures. At 3rd level, an exemplar is immune to fear (magical or otherwise). Each ally within 10 feet of her gains a +4 morale bonus on saving throws against fear effects. This ability functions only while the exemplar is conscious, not if she is unconscious or dead. At 3rd level, an exemplar is immune to all diseases, including supernatural and magical diseases, including mummy rot. At 3rd level, and every three levels thereafter, an exemplar can select one mercy or cruelty. Exemplars with the lay on hands ability must select mercies, while exemplars with the slay with hands ability must select cruelties. Each mercy adds an effect to the exemplar’s lay on hands ability, and each cruelty adds an effect to the exemplar’s slay with hands ability. Whenever an exemplar uses lay on hands to heal damage to one target, the target also receives the additional effects from all of the mercies possessed by the paladin; whenever an exemplar uses slay with hands to deal damage to one target, the target also suffers the additional effects from all of the cruelties possessed by the exemplar. A mercy can remove a condition caused by a curse, disease, or poison without curing the affliction. Such conditions return after 1 hour unless the mercy actually removes the affliction that causes the condition. At 3rd level, the exemplar can select from the following initial mercies or cruelties. Fatigued (Mercy): The target is no longer fatigued. Shaken (Mercy): The target is no longer shaken. Sickened (Mercy): The target is no longer sickened. At 6th level, an exemplar adds the following mercies or cruelties to the list of those that can be selected. Dazed (Mercy): The target is no longer dazed. Diseased (Mercy): The exemplar’s lay on hands ability also acts as remove disease, using the exemplar’s level as the caster level. Staggered (Mercy): The target is no longer staggered, unless the target is at exactly 0 hit points. Diseased (Cruelty): The exemplar’s slay with hands ability also acts as contagion, using the exemplar’s level as the caster level. At 9th level, an exemplar adds the following mercies to the list of those that can be selected. Cursed (Mercy): The exemplar’s lay on hands ability also acts as remove curse, using the exemplar’s level as the caster level. Exhausted (Mercy): The target is no longer exhausted. The exemplar must have the fatigue mercy before selecting this mercy. Frightened (Mercy): The target is no longer frightened. The exemplar must have the shaken mercy before selecting this mercy. Nauseated (Mercy): The target is no longer nauseated. The exemplar must have the sickened mercy before selecting this mercy. Poisoned (Mercy): The exemplar’s lay on hands ability also acts as neutralize poison, using the exemplar’s level as the caster level. Cursed (Cruelty): The exemplar’s slay with hands ability also acts as bestow curse, using the exemplar’s level as the caster level. Exhausted (Cruelty): The target is exhausted for 1 round. (Fort save negates.) The exemplar must have the fatigue cruelty before selecting this cruelty. Frightened (Cruelty): The target is frightened for 1 round. This is a fear effect. (Will save negates.) The exemplar must have the shaken cruelty before selecting this cruelty. Nauseated (Cruelty): The target is nauseated for 1 round. (Fort save negates.) The exemplar must have the sickened cruelty before selecting this cruelty. Poisoned (Cruelty): The exemplar’s slay with hands ability also acts as poison, using the exemplar’s level as the caster level. At 12th level, an exemplar adds the following mercies to the list of those that can be selected. Blinded (Mercy): The target is no longer blinded. Deafened (Mercy): The target is no longer deafened. Paralyzed (Mercy): The target is no longer paralyzed. Stunned (Mercy): The target is no longer stunned. These abilities are cumulative. For example, a 12th-level exemplar’s lay on hands ability heals 6d6 points of damage and might also cure Fatigued and Exhausted conditions as well as removing diseases and neutralizing poisons. Once a condition or spell effect is chosen, it can’t be changed. When an exemplar reaches 4th level, she gains the supernatural ability to channel energy like a cleric. An exemplar with the lay on hands ability channels positive energy; an exemplar with the slay with hands ability channels negative energy. Using this ability consumes two uses of her lay on hands or slay with hands ability. An exemplar uses her level as her effective cleric level when channeling energy. This is a Charisma-based ability. Beginning at 4th level, an exemplar gains the ability to cast a small number of divine spells which are drawn from the exemplar spell list. Her alignment, however, may restrict her from casting certain spells opposed to her moral or ethical beliefs; see Chaotic, Evil, Good, and Lawful Spells. An exemplar must choose and prepare her spells in advance. To prepare or cast a spell, an exemplar must have a Charisma score equal to at least 10 + the spell level. The Difficulty Class for a saving throw against a exemplar’s spell is 10 + the spell level + the exemplar’s Charisma modifier. Like other spellcasters, an exemplar can cast only a certain number of spells of each spell level per day. Her base daily spell allotment is given on Table: Exemplar. In addition, she receives bonus spells per day if she has a high Charisma score (see Table: Ability Modifiers and Bonus Spells). 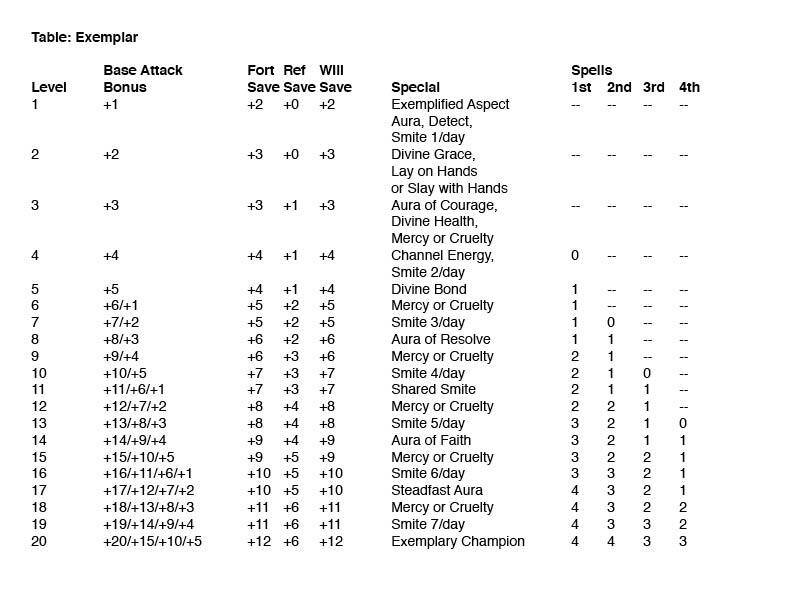 When Table: Exemplar indicates that the exemplar gets 0 spells per day of a given spell level, she gains only the bonus spells she would be entitled to based on her Charisma score for that spell level. An exemplar must spend 1 hour each day in quiet prayer and meditation to regain her daily allotment of spells. An exemplar may prepare and cast any spell on the exemplar spell list, provided that she can cast spells of that level, but she must choose which spells to prepare during her daily meditation. Through 3rd level, an exemplar has no caster level. At 4th level and higher, her caster level is equal to her exemplar level – 3. Upon reaching 5th level, an exemplar forms a divine bond with her exemplified aspect. This bond can take one of two forms. Once the form is chosen, it cannot be changed. The first type of bond allows the exemplar to enhance her weapon as a standard action by calling upon the aid of her exemplified aspect for 1 minute per exemplar level. When called, at the exemplar’s option, the aspect causes the weapon to shed light as a torch. At 5th level, the aspect grants the weapon a +1 enhancement bonus. For every three levels beyond 5th, the weapon gains another +1 enhancement bonus, to a maximum of +6 at 20th level. These bonuses can be added to the weapon, stacking with existing weapon bonuses to a maximum of +5, or they can be used to add any of the following weapon properties: brilliant energy, defending, disruption, flaming, flaming burst, keen, merciful, and speed. Additionally, the exemplar can add the anarchic property if she is Chaotic; the axiomatic property if she is Lawful; the holy property if she is Good; or the unholy property if she is Evil. Adding these properties consumes an amount of bonus equal to the property’s cost (see Table: Melee Weapon Special Abilities). These bonuses are added to any properties the weapon already has, but duplicate abilities do not stack. If the weapon is not magical, at least a +1 enhancement bonus must be added before any other properties can be added. The bonus and properties granted by the aspect are determined when the aspect is called and cannot be changed until the aspect is called again. The exemplified aspect imparts no bonuses if the weapon is held by anyone other than the exemplar but resumes giving bonuses if returned to the exemplar. These bonuses apply to only one end of a double weapon. An exemplar can use this ability once per day at 5th level, and one additional time per day for every four levels beyond 5th, to a total of four times per day at 17th level. If a weapon bonded with an exemplified aspect is destroyed, the exemplar loses the use of this ability for 30 days, or until she gains a level, whichever comes first. During this 30-day period, the exemplar takes a –1 penalty on attack and weapon damage rolls. The second type of bond allows an exemplar to gain the service of an unusually intelligent, strong, and loyal steed to serve her in her crusade against her opposing aspect. This mount is usually a heavy horse (for a Medium exemplar) or a pony (for a Small exemplar), although more exotic mounts, such as a boar, camel, or dog are also suitable. This mount functions as a druid’s animal companion, using the exemplar’s level as her effective druid level. Bonded mounts have an Intelligence of at least 6. Once per day, as a full-round action, an exemplar may magically call her mount to her side. This ability is the equivalent of a spell of a level equal to one-third the exemplar’s level. The mount immediately appears adjacent to the exemplar. An exemplar can use this ability once per day at 5th level, and one additional time per day for every 4 levels thereafter, for a total of four times per day at 17th level. At 11th level, the mount gains a simple template, and becomes a magical beast for the purposes of determining which spells affect it. The simple template gained depends on the exemplar’s exemplified aspect: the mount of an exemplar who exemplifies Chaos gains the anarchic template, the mount of an exemplar who exemplifies Law gains the axiomatic template, the mount of an exemplar who exemplifies Good gains the celestial template, and the mount of an exemplar who exemplifies Evil gains the fiendish template. At 15th level, an exemplar’s mount gains spell resistance equal to the exemplar’s level + 11. Should the exemplar’s mount die, the exemplar may not summon another mount for 30 days or until she gains an exemplar level, whichever comes first. During this 30-day period, the exemplar takes a –1 penalty on attack and weapon damage rolls. At 8th level, an exemplar is immune to charm spells and spell-like abilities. Each ally within 10 feet of her gains a +4 morale bonus on saving throws against charm effects. This ability functions only while the exemplar is conscious, not if she is unconscious or dead. At 11th level, an exemplar can expend two uses of her smite ability to grant the ability to smite to all allies within 10 feet, using her bonuses. Allies must use this smite ability by the start of the exemplar’s next turn and the bonuses last for 1 minute. Using this ability is a free action. Creatures that possess the exemplar’s opposing aspect gain no benefit from this ability. At 14th level, an exemplar’s weapons are treated as X-aligned for the purposes of overcoming Damage Reduction, where X is her exemplified aspect. Any attack made against an enemy within 10 feet of her is treated as X-aligned for the purposes of overcoming Damage Reduction. At 17th level, an exemplar gains DR 5/X and immunity to compulsion spells and spell-like abilities, where X is her opposing aspect. Each ally within 10 feet of her gains a +4 morale bonus on saving throws against compulsion effects. At 20th level, an exemplar becomes a conduit for the power of her exemplified aspect. Her DR increases to 10/X, where X is her opposing aspect. Whenever she uses smite and successfully strikes an outsider that possesses her opposing aspect, the outsider is also subject to a banishment, using her exemplar level as the caster level (her weapon and holy symbol automatically count as objects that the subject hates). After the banishment effect and the damage from the attack is resolved, the smite immediately ends. In addition, whenever an exemplar channels positive energy or uses lay on hands to heal a creature, she heals the maximum possible amount. Whenever an exemplar channels negative energy or uses slay with hands to damage a creature, she deals the maximum possible amount. An exemplar who ceases to possess her exemplified aspect loses all exemplar spells and class features (including the service of the exemplar’s mount, but not weapon, armor, and shield proficiencies). She may not progress any further in levels as an exemplar of her exemplified aspect. She regains her abilities and advancement potential if she atones for her violations (see atonement), as appropriate. *See below for the spell text. When you cast this spell on a melee weapon you imbue it with a powerful anarchic energy, granting the weapon the bane weapon quality against lawful outsiders. Furthermore, whenever you score a successful critical hit against an outsider with the lawful subtype, you not only deal normal critical damage with the weapon but also nauseate the outsider for 1d3 rounds—the outsider can reduce this nauseated condition to sickened for 1 round with a successful Fortitude save. This spell infuses an area with anarchic power. The DC to resist spells or spell-like abilities with the chaotic descriptor or channeled energy that damages lawful outsiders (as when using Alignment Channel) increases by +2. In addition, lawful outsiders take a –1 penalty on attack rolls, damage rolls, and saving throws, and they cannot be called or summoned into an anarchic space. If the anarchic space contains an altar, shrine, or other permanent fixture dedicated to your deity, pantheon, or chaotic-aligned higher power, the modifiers given above are doubled. You cannot cast anarchic space in an area with a permanent fixture dedicated to a deity other than yours. This transmutation makes a weapon strike true against lawful foes. The weapon is treated as having a +1 enhancement bonus for the purpose of bypassing the DR of lawful creatures or striking lawful incorporeal creatures (though the spell doesn’t grant an actual enhancement bonus). The weapon also becomes chaotic-aligned, which means it can bypass the DR of certain creatures. (This effect overrides and suppresses any other alignment the weapon might have.) Individual arrows or bolts can be transmuted, but affected projectile weapons (such as bows) don’t confer the benefit to the projectiles they shoot. In addition, all critical hit rolls against lawful foes are automatically successful, so every threat is a critical hit. This last effect does not apply to any weapon that already has a magical effect related to critical hits, such as a keen weapon or a vorpal sword. You fire a shimmering arrow of pure discord from your holy symbol at any one target in range as a ranged touch attack. A lawful creature struck by an arrow of law takes 1d8 points of damage per two caster levels (maximum 5d8). A lawful outsider instead takes 1d6 points of damage per caster level (maximum 10d6) and is dazed for 1 round. A successful Will save reduces the damage to half and negates the daze effect. This spell deals only half damage to creatures that are neither chaotic nor lawful, and they are not dazed. The arrow has no effect on chaotic creatures. You fire a shimmering arrow of pure malevolence from your holy symbol at any one target in range as a ranged touch attack. A good creature struck by an arrow of law takes 1d8 points of damage per two caster levels (maximum 5d8). A good outsider instead takes 1d6 points of damage per caster level (maximum 10d6) and is dazed for 1 round. A successful Will save reduces the damage to half and negates the daze effect. This spell deals only half damage to creatures that are neither evil nor good, and they are not dazed. The arrow has no effect on evil creatures. You fire a shimmering arrow of pure righteousness from your holy symbol at any one target in range as a ranged touch attack. An evil creature struck by an arrow of good takes 1d8 points of damage per two caster levels (maximum 5d8). An evil outsider instead takes 1d6 points of damage per caster level (maximum 10d6) and is dazed for 1 round. A successful Will save reduces the damage to half and negates the daze effect. This spell deals only half damage to creatures that are neither evil nor good, and they are not dazed. The arrow has no effect on good creatures. You fire a shimmering arrow of pure order from your holy symbol at any one target in range as a ranged touch attack. A chaotic creature struck by an arrow of law takes 1d8 points of damage per two caster levels (maximum 5d8). A chaotic outsider instead takes 1d6 points of damage per caster level (maximum 10d6) and is dazed for 1 round. A successful Will save reduces the damage to half and negates the daze effect. This spell deals only half damage to creatures that are neither chaotic nor lawful, and they are not dazed. The arrow has no effect on lawful creatures. When you cast this spell on a melee weapon you imbue it with a powerful axiomatic energy, granting the weapon the bane weapon quality against chaotic outsiders. Furthermore, whenever you score a successful critical hit against an outsider with the chaotic subtype, you not only deal normal critical damage with the weapon but also nauseate the outsider for 1d3 rounds—the outsider can reduce this nauseated condition to sickened for 1 round with a successful Fortitude save. This spell infuses an area with exiomatic power. The DC to resist spells or spell-like abilities with the lawful descriptor or channeled energy that damages chaotic outsiders (as when using Alignment Channel) increases by +2. In addition, chaotic outsiders take a –1 penalty on attack rolls, damage rolls, and saving throws, and they cannot be called or summoned into an axiomatic space. If the axiomatic space contains an altar, shrine, or other permanent fixture dedicated to your deity, pantheon, or lawful-aligned higher power, the modifiers given above are doubled. You cannot cast axiomatic space in an area with a permanent fixture dedicated to a deity other than yours. This transmutation makes a weapon strike true against chaotic foes. The weapon is treated as having a +1 enhancement bonus for the purpose of bypassing the DR of chaotic creatures or striking chaotic incorporeal creatures (though the spell doesn’t grant an actual enhancement bonus). The weapon also becomes lawful-aligned, which means it can bypass the DR of certain creatures. (This effect overrides and suppresses any other alignment the weapon might have.) Individual arrows or bolts can be transmuted, but affected projectile weapons (such as bows) don’t confer the benefit to the projectiles they shoot. In addition, all critical hit rolls against chaotic foes are automatically successful, so every threat is a critical hit. This last effect does not apply to any weapon that already has a magical effect related to critical hits, such as a keen weapon or a vorpal sword. You channel the power of good into the target, temporarily giving it powers similar to those of an exemplar. The target gains the ability to use detect evil at will as a spell-like ability, immunity to disease (suppressing any diseases currently affecting it), and immunity to fear (ending any fear effects currently affecting it); can lay on hands once as an exemplar of 1/2 your caster level; and can smite evil once as an exemplar of 1/2 your caster level. It adds its Charisma bonus to all its saving throws. It can use spell completion, spell trigger, or other magic items that require the ability to cast spells as an exemplar. Any abilities not used by the time the spell expires are lost. This spell has no effect if cast on an exemplar. You channel the power of evil into the target, temporarily giving it powers similar to those of an exemplar. The target gains the ability to use detect good at will as a spell-like ability, immunity to disease (suppressing any diseases currently affecting it), and immunity to fear (ending any fear effects currently affecting it); can slay with hands once as an exemplar of 1/2 your caster level; and can smite good once as an exemplar of 1/2 your caster level. It adds its Charisma bonus to all its saving throws. It can use spell completion, spell trigger, or other magic items that require the ability to cast spells as an exemplar. Any abilities not used by the time the spell expires are lost. This spell has no effect if cast on an exemplar. You strengthen the bond between your divine bond weapon and its celestial spirit. The weapon gains the ghost touch property. You may change your weapon’s damage type (bludgeoning, piercing, slashing) as a swift action. You gain a sacred bonus to your CMD against disarm and sunder attacks directed at your bonded weapon; this bonus is equal to half your caster level. You strengthen the bond between your divine bond weapon and its fiendish spirit. The weapon gains the ghost touch property. You may change your weapon’s damage type (bludgeoning, piercing, slashing) as a swift action. You gain a profane bonus to your CMD against disarm and sunder attacks directed at your bonded weapon; this bonus is equal to half your caster level. You fall unconscious but also unleash a spectacular wave of anarchic energy that heartens and heals your allies while leaving your opponents daunted and damaged. You can cast this spell as either a standard action on your turn, or as an immediate action when brought to below 0 hit points. If cast as a standard action, you are immediately reduced to -1 hit points, but stable, after casting the spell. When you cast this spell, any chaotic creature within range is healed for 1d6 points of damage per two caster levels. All lawful creatures within range take the same amount as damage instead (a successful Will save halves this damage). In addition, all allies and enemies within range are affected as if by the prayer spell for 1 round per caster level. You fall unconscious but also unleash a spectacular wave of holy energy that heartens and heals your allies while leaving your opponents daunted and damaged. You can cast this spell as either a standard action on your turn, or as an immediate action when brought to below 0 hit points. If cast as a standard action, you are immediately reduced to -1 hit points, but stable, after casting the spell. When you cast this spell, any good creature within range is healed for 1d6 points of damage per two caster levels. All evil creatures within range take the same amount as damage instead (a successful Will save halves this damage). In addition, all allies and enemies within range are affected as if by the prayer spell for 1 round per caster level. You fall unconscious but also unleash a spectacular wave of axiomatic energy that heartens and heals your allies while leaving your opponents daunted and damaged. You can cast this spell as either a standard action on your turn, or as an immediate action when brought to below 0 hit points. If cast as a standard action, you are immediately reduced to -1 hit points, but stable, after casting the spell. When you cast this spell, any lawful creature within range is healed for 1d6 points of damage per two caster levels. All chaotic creatures within range take the same amount as damage instead (a successful Will save halves this damage). In addition, all allies and enemies within range are affected as if by the prayer spell for 1 round per caster level. You fall unconscious but also unleash a spectacular wave of unholy energy that heartens and heals your allies while leaving your opponents daunted and damaged. You can cast this spell as either a standard action on your turn, or as an immediate action when brought to below 0 hit points. If cast as a standard action, you are immediately reduced to -1 hit points, but stable, after casting the spell. When you cast this spell, any evil creature within range is healed for 1d6 points of damage per two caster levels. All good creatures within range take the same amount as damage instead (a successful Will save halves this damage). In addition, all allies and enemies within range are affected as if by the prayer spell for 1 round per caster level. This transmutation makes a weapon strike true against evil foes. The weapon is treated as having a +1 enhancement bonus for the purpose of bypassing the DR of evil creatures or striking evil incorporeal creatures (though the spell doesn’t grant an actual enhancement bonus). The weapon also becomes good-aligned, which means it can bypass the DR of certain creatures. (This effect overrides and suppresses any other alignment the weapon might have.) Individual arrows or bolts can be transmuted, but affected projectile weapons (such as bows) don’t confer the benefit to the projectiles they shoot. You challenge an evil creature to bring the fight to you, or suffer the consequences. You gain a +2 sacred bonus on all melee attacks against the subject of the spell. At the end of its turn, if the target has not made at least one attack on you, it becomes sickened. If you move away from the target, the spell ends. You challenge a good creature to bring the fight to you, or suffer the consequences. You gain a +2 profane bonus on all melee attacks against the subject of the spell. At the end of its turn, if the target has not made at least one attack on you, it becomes sickened. If you move away from the target, the spell ends. You imbue your armor with a chaotic aura. It gains a +1 enhancement bonus per four caster levels (maximum +5 at 20th level). When using your smite ability, you gain DR 5/lawful. Choose a specific subtype of evil outsider when you cast this spell, such as devil or archon. All manufactured weapons in the area of effect bypass the DR of that type of outsider. The weapons do not become aligned or change composition. This transmutation makes a weapon strike true against good foes. The weapon is treated as having a +1 enhancement bonus for the purpose of bypassing the DR of good creatures or striking good incorporeal creatures (though the spell doesn’t grant an actual enhancement bonus). The weapon also becomes evil-aligned, which means it can bypass the DR of certain creatures. (This effect overrides and suppresses any other alignment the weapon might have.) Individual arrows or bolts can be transmuted, but affected projectile weapons (such as bows) don’t confer the benefit to the projectiles they shoot. You create a grim beam of darkness that acts as a +1 unholy lance suitable for your size. You must have a free hand when casting the spell and, once you call the lance into being, you cannot switch it to another hand or put it down without prematurely ending the spell. As a standard action while holding a dark lance, you can choose not to make an attack and instead hold the lance aloft as a beacon of darkness and malice, creating an area of dim light with a radius of 90 feet. You imbue your armor with a malevolent aura. It gains a +1 enhancement bonus per four caster levels (maximum +5 at 20th level). When using your smite ability, you gain DR 5/good. Choose a specific subtype of good outsider when you cast this spell, such as angel or archon. You gain a powerful aura. Any hostile creature within a 20-foot radius of you must make a Will save to resist the effects of this aura. If the creature fails, it takes a –2 penalty on attack rolls and saving throws and to Armor Class for the duration of this spell, or until it successfully hits you with an attack. A creature that has resisted or broken the effect cannot be affected again by this particular casting of archon’s aura. After casting this spell, the next creature you attack using your smite class ability is engulfed in flames of anarchic energy. At the start of its turn, the target takes 1d6 points of damage, and takes an additional 1d6 points of damage each time it attacks a creature other than you. If the creature is an outsider with the lawful subtype or a lawful-aligned dragon this damage increases to 1d10. With a successful Saving Throw, a creature is affected by this spell for only 1 round. This damage is divine in nature and bypasses any DR the creature possesses. After casting this spell, the next creature you attack using your smite class ability is engulfed in flames of negative energy. At the start of its turn, the target takes 1d6 points of damage, and takes an additional 1d6 points of damage each time it attacks a creature other than you. If the creature is an outsider with the good subtype or a good-aligned dragon this damage increases to 1d10. With a successful Saving Throw, a creature is affected by this spell for only 1 round. This damage is divine in nature and bypasses any DR the creature possesses. After casting this spell, the next creature you attack using your smite class ability is engulfed in flames of positive energy. At the start of its turn, the target takes 1d6 points of damage, and takes an additional 1d6 points of damage each time it attacks a creature other than you. If the creature is an outsider with the evil subtype, an evil-aligned dragon, or an undead creature this damage increases to 1d10. With a successful Saving Throw, a creature is affected by this spell for only 1 round. This damage is divine in nature and bypasses any DR the creature possesses. After casting this spell, the next creature you attack using your smite class ability is engulfed in flames of axiomatic energy. At the start of its turn, the target takes 1d6 points of damage, and takes an additional 1d6 points of damage each time it attacks a creature other than you. If the creature is an outsider with the chaotic subtype or a chaotic-aligned dragon this damage increases to 1d10. With a successful Saving Throw, a creature is affected by this spell for only 1 round. This damage is divine in nature and bypasses any DR the creature possesses. When you cast this spell on a melee weapon you imbue it with a powerful holy energy, granting the weapon the bane weapon quality against evil outsiders. Furthermore, whenever you score a successful critical hit against an outsider with the evil subtype, you not only deal normal critical damage with the weapon but also nauseate the outsider for 1d3 rounds—the outsider can reduce this nauseated condition to sickened for 1 round with a successful Fortitude save. You whisper a single word in the primordial language of good that is anathema to the minions of evil and strengthens the resolve of good creatures. Evil creatures within the burst must make a Fortitude Saving Throw or become sickened for 1 round/ level. Evil outsiders with the evil subtype, evil-aligned dragons, and undead in the burst also take 2d8 points of damage if they fail their saves. Good-aligned creatures in the burst gain a +2 sacred bonus on attack and damage rolls for 1 round. You imbue your armor with a lawful aura. It gains a +1 enhancement bonus per four caster levels (maximum +5 at 20th level). When using your smite ability, you gain DR 5/chaotic. Choose a specific subtype of chaotic outsider when you cast this spell, such as demon or protean. Entreating your deity for aid, you make a temporary oath of peace, granting you superior defenses but means you can’t attack for the duration of the oath. For as long as you are subject to this spell, you gain a +5 sacred bonus to AC and on saving throws, as well as DR 10/evil. If you make a direct or indirect attack or any show any hostility toward any creature, the spell immediately ends. Entreating your deity for aid, you make a temporary oath of peace, granting you superior defenses but means you can’t attack for the duration of the oath. For as long as you are subject to this spell, you gain a +5 profane bonus to AC and on saving throws, as well as DR 10/good. If you make a direct or indirect attack or any show any hostility toward any creature, the spell immediately ends. When you cast this spell, you beseech an evil-aligned outsider for their aid against good. The outsider infuses a small portion of its own power into you, making you a powerful force for evil. You gain a +2 morale bonus on all Perception checks made against good creatures, a +2 bonus on Initiative checks, and detect good as a constant spell-like ability. Any critical threat roll made against a good creature with a weapon you wield is automatically confirmed. Although this surge of power can be activated against any good opponent, this ability activates automatically as soon as you attack any good outsider, regardless of whether you hit or not, and regardless of whether you actually recognize that the target is in fact a good outsider. In such cases the activation is a free action. Nonevil spellcasters can cast this spell, but doing so causes them to be sickened (for spellcasters who are neither good nor evil) or staggered (for spellcasters who are good) for the spell’s duration. This spell profanes an area with unholy power. The DC to resist spells or spell-like abilities with the evil descriptor or channeled energy that damages good outsiders (as when using Alignment Channel) increases by +2. In addition, good outsiders take a –1 penalty on attack rolls, damage rolls, and saving throws, and they cannot be called or summoned into a profane space. If the profane space contains an altar, shrine, or other permanent fixture dedicated to your deity, pantheon, or evil-aligned higher power, the modifiers given above are doubled. You cannot cast profane space in an area with a permanent fixture dedicated to a deity other than yours. When you cast this spell, you beseech a good-aligned outsider for their aid against evil. The outsider infuses a small portion of its own power into you, making you a powerful force for good. You gain a +2 morale bonus on all Perception checks made against evil creatures, a +2 bonus on Initiative checks, and detect evil as a constant spell-like ability. Any critical threat roll made against an evil creature with a weapon you wield is automatically confirmed. Although this surge of power can be activated against any evil opponent, this ability activates automatically as soon as you attack any evil outsider, regardless of whether you hit or not, and regardless of whether you actually recognize that the target is in fact an evil outsider. In such cases the activation is a free action. Nongood spellcasters can cast this spell, but doing so causes them to be sickened (for spellcasters who are neither good nor evil) or staggered (for spellcasters who are evil) for the spell’s duration. This spell sanctifies an area with heavenly power. The DC to resist spells or spell-like abilities with the good descriptor or channeled energy that damages evil outsiders (as when using Alignment Channel) increases by +2. In addition, evil outsiders take a –1 penalty on attack rolls, damage rolls, and saving throws, and they cannot be called or summoned into a sacred space. If the sacred space contains an altar, shrine, or other permanent fixture dedicated to your deity, pantheon, or good-aligned higher power, the modifiers given above are doubled. You cannot cast sacred space in an area with a permanent fixture dedicated to a deity other than yours. You imbue your armor with a righteous aura. It gains a +1 enhancement bonus per four caster levels (maximum +5 at 20th level). When using your smite ability, you gain DR 5/evil. Choose a specific subtype of evil outsider when you cast this spell, such as daemon, demon, devil, or div. You create a disk of sunlight on one arm. Any creature that strikes you with a melee attack deals normal damage, but also takes 1d6 points of fire damage + 1 point per caster level (maximum +15). Creatures with reach weapons are not subject to this damage if they attack you. The shield provides illumination as if it were a continual flame spell. You can only have one instance of this spell in effect at a time. It does not stack with similar damaging aura spells such as fire shield. When you cast this spell on a melee weapon you imbue it with a powerful unholy energy, granting the weapon the bane weapon quality against good outsiders. Furthermore, whenever you score a successful critical hit against an outsider with the good subtype, you not only deal normal critical damage with the weapon but also nauseate the outsider for 1d3 rounds—the outsider can reduce this nauseated condition to sickened for 1 round with a successful Fortitude save. You whisper a single word in the primordial language of good that is anathema to the minions of good and strengthens the resolve of evil creatures. Good creatures within the burst must make a Fortitude Saving Throw or become sickened for 1 round/ level. Good outsiders with the good subtype and good-aligned dragons in the burst also take 2d8 points of damage if they fail their saves. Evil-aligned creatures in the burst gain a +2 profane bonus on attack and damage rolls for 1 round. You and your mount lay down a trail of anarchic mist behind you as you move that makes passage easier for chaotic creatures but more difficult for lawful creatures. This trail of mist appears behind your mount in a straight line starting where you cast the spell and ending where your mount ends its movement. The mist takes the form of a path 10 feet wide and up to 120 feet long and always floats just above the ground, up to a height of 1 foot. Thereafter, the mist persists for 1 round per level. Chaotic creatures may walk along the top of the mist as if it were solid, treating squares of difficult terrain containing the mist as normal terrain. Lawful creatures find the mist thick and cloying, and treat squares of normal terrain containing the mist as difficult terrain instead. Neutral creatures pass through the mist with no effect. The mist has no effect on obstacles or otherwise impassable terrain, and does not block sight or provide concealment. Except for very special circumstances (such as an anarchic or axiomatic mount), mounts use the alignment of their rider when determining how this spell affects them. You must be mounted to enjoy the benefits of this spell. If you dismount, get knocked off, or take any other action that separates you from your mount, the spell immediately ends, although the mist remains for the spell’s normal duration. A wake of chaos cannot follow across water, underwater, or through the air in the case of a mount capable of walking on water, swimming, or flight. You and your mount lay down a trail of dull, malevolent mist behind you as you move that makes passage easier for evil creatures but more difficult for good creatures. This dim trail of mist appears behind your mount in a straight line starting where you cast the spell and ending where your mount ends its movement. The mist takes the form of a path 10 feet wide and up to 120 feet long and always floats just above the ground, up to a height of 1 foot. Thereafter, the mist persists for 1 round per level. Evil creatures may walk along the top of the mist as if it were solid, treating squares of difficult terrain containing the mist as normal terrain. Good creatures find the mist thick and cloying, and treat squares of normal terrain containing the mist as difficult terrain instead. Neutral creatures pass through the mist with no effect. The mist has no effect on obstacles or otherwise impassable terrain, and does not block sight or provide concealment. Except for very special circumstances (such as a celestial or fiendish mount), mounts use the alignment of their rider when determining how this spell affects them. You must be mounted to enjoy the benefits of this spell. If you dismount, get knocked off, or take any other action that separates you from your mount, the spell immediately ends, although the mist remains for the spell’s normal duration. A wake of evil cannot follow across water, underwater, or through the air in the case of a mount capable of walking on water, swimming, or flight. You and your mount lay down a trail of glowing, heavenly mist behind you as you move that makes passage easier for good creatures but more difficult for evil creatures. This glowing trail of mist appears behind your mount in a straight line starting where you cast the spell and ending where your mount ends its movement. The mist takes the form of a path 10 feet wide and up to 120 feet long and always floats just above the ground, up to a height of 1 foot. Thereafter, the mist persists for 1 round per level. Good creatures may walk along the top of the mist as if it were solid, treating squares of difficult terrain containing the mist as normal terrain. Evil creatures find the mist thick and cloying, and treat squares of normal terrain containing the mist as difficult terrain instead. Neutral creatures pass through the mist with no effect. The mist has no effect on obstacles or otherwise impassable terrain, and does not block sight or provide concealment. A wake of good cannot follow across water, underwater, or through the air in the case of a mount capable of walking on water, swimming, or flight. You and your mount lay down a trail of axiomatic mist behind you as you move that makes passage easier for lawful creatures but more difficult for chaotic creatures. This trail of mist appears behind your mount in a straight line starting where you cast the spell and ending where your mount ends its movement. The mist takes the form of a path 10 feet wide and up to 120 feet long and always floats just above the ground, up to a height of 1 foot. Thereafter, the mist persists for 1 round per level. Lawful creatures may walk along the top of the mist as if it were solid, treating squares of difficult terrain containing the mist as normal terrain. Chaotic creatures find the mist thick and cloying, and treat squares of normal terrain containing the mist as difficult terrain instead. Neutral creatures pass through the mist with no effect. The mist has no effect on obstacles or otherwise impassable terrain, and does not block sight or provide concealment. A wake of law cannot follow across water, underwater, or through the air in the case of a mount capable of walking on water, swimming, or flight. Each weapon this spell affects each shines with pale light that dimly illuminates a 5-foot square. These weapons also ignore the DR of chaotic creatures that have DR 5 or lower, as long as the damage reduction is not DR/epic. Each weapon this spell affects each shines with pale light that dimly illuminates a 5-foot square. These weapons also ignore the DR of evil creatures that have DR 5 or lower, as long as the damage reduction is not DR/epic. Each weapon this spell affects each shines with pale light that dimly illuminates a 5-foot square. These weapons also ignore the DR of good creatures that have DR 5 or lower, as long as the damage reduction is not DR/epic. Each weapon this spell affects each shines with pale light that dimly illuminates a 5-foot square. These weapons also ignore the DR of lawful creatures that have DR 5 or lower, as long as the damage reduction is not DR/epic. Magic also has a concept of “Timmy cards.” These are cards that look cool, but aren’t actually that great in the game. The purpose of such cards is to reward people for really mastering the game, and making players feel smart when they’ve figured out that one card is better than the other. While D&D doesn’t exactly do that, it is true that certain game choices are deliberately better than others. There’s a third concept that we took from Magic-style rules design, though. Only with six years of hindsight do I call the concept “Ivory Tower Game Design.” (Perhaps a bit of misnomer, but it’s got a ring to it.) This is the approach we took in 3rd Edition: basically just laying out the rules without a lot of advice or help. This strategy relates tangentially to the second point above. The idea here is that the game just gives the rules, and players figure out the ins and outs for themselves — players are rewarded for achieving mastery of the rules and making good choices rather than poor ones. Perhaps as is obvious from the name I’ve coined for this rules writing style, I no longer think this is entirely a good idea. I was just reading a passage from a recent book, and I found it rather obtuse. But it wasn’t the writer’s fault. He was just following the lead the core books offered him. Nevertheless, the whole thing would have been much better if the writer had just broken through the barrier this kind of design sets up between designer and player and just told the reader what the heck he was talking about. To continue to use the simplistic example above, the Toughness feat could have been written to make it clear that it was for 1st-level elf wizards (where it is likely to give them a 100 percent increase in hit points). It’s also handy when you know you’re playing a one-shot session with 1st-level characters, like at a convention (you sure don’t want to take item creation feats in such an instance, for example). Ivory Tower Game Design requires a two-step process on the part of the reader. You read the rule, and then you think about how it fits in with the rest of the game. There’s a moment of understanding, and then a moment of comprehension. That’s not a terrible thing, but neither is just providing the reader with both steps, at least some of the time. While there’s something to be said for just giving gamers the rules to do with as they please, there’s just as much to be said for simply giving it to the reader straight in a more honest, conversational approach. Perhaps that’s what the upcoming D&D for Dummies book will be. I hope so. All wizards must be Lawful Neutral, because the study of magic demands the utmost discipline. A wizard who shifts away from LN, or fails to find/research a new spell during the course of a level, can no longer advance in wizard levels. And so on and so forth, with no exceptions. Every restriction and code of conduct has a basis in fiction or legend, and D&D gamers in the Bob Loblaw universe have come up with all kinds of creative interpretations and rationalizations for the details that don’t always make sense. Like the creators of the D&D we know, Bob never realized how seriously future generations would treat his ideas, but those ideas are now out of his hands. If you were to visit the Bob Loblaw universe via a magical portal, and chat with its D&D gamers about the possibility of say, a fighter with some sense of honor and compassion, you’d at best be met with blank uncomprehending stares. A friendly Bob-universe gamer might reply “But what would make such a fighter different than a paladin? Fighters have always been True Neutral, dedicated to nothing but the mastery of their blade; best not to break the tried-and-true tradition.” Question the need for such narrow class definitions on an internet message board, and you’d be inundated with gamers accusing you of everything from not understanding the English language to being a ruthless power gamer trying to put one over on your DM. Would you want to play in a Bob Loblaw campaign? It might be fun to play within a set of such specific and quirky tropes once or twice, but I suspect that the narrow tropes would begin to chafe after a few characters. And that’s how inclusivity advocates feel about the traditional D&D paladin. It’s as if Gary or Dave went through the magical portal, played a paladin in Bob’s game once, and then threw Bob’s paladin class into his own D&D campaigns in our universe because it seemed like a cute trope to him. And the reason we inclusivity advocates can get so exasperated with diehard paladin traditionalists is the same reason that you’d get exasperated talking to a Bob Loblaw gamer. Those who would deny others the opportunity to role play an interesting character merely because it falls outside of an overly narrow trope which gets treated with apparently dogmatic reverence — for utterly mysterious reasons, for many of us — are profoundly frustrating and close-minded. But why don’t you like the LG restriction and the Code? Inclusivity advocates see the Code and the restriction as a straitjacket on potential fun; we don’t want two guys who we’ve never met (Gygax and Arneson) telling us how to play our characters or run our campaigns. From both a DM’s and a player’s perspective, the traditional paladin is a waste of page space — if you think of each page as a fun-to-word-count ratio, the paladin section scores the lowest of any class because of the very limited number of possible NPCs and PCs it can yield. Also, having just one class with a single-alignment restriction implies that Lawful Good is a special divinely-sanctioned, or ‘best,’ alignment. Which would fit in a game world of Christian-like monotheism, but D&D’s default polytheism makes it a terrible fit. And yes, traditional paladins have a way of upsetting people. Aside from the horror stories we’ve all heard, all those restrictions just seem to trip up otherwise reasonable gamers. I myself know a player who refuses to even consider playing paladins — even in 4e or 5e! — because of everything that the traditional restrictions imply. Sure, there are ways to DM and play traditional paladins in a fun way, but there’s clearly something about its restrictions and Code that turn the class into a powder keg. Isn’t the paladin’s restrictions a sacrifice for greater power? This is arguably true in early D&D editions, where a paladin is everything a fighter is, and more, but D&D hasn’t used role playing restrictions as a counterbalance to greater power since 2000. Also, fighters have had their own class abilities since 2e. (And before 3e, paladins required more XP to gain levels anyway.) And finally, balancing power with role playing restrictions is a terrible idea in general. But what sets a paladin of any other alignment apart from a cleric? Well, the same thing that sets a LG paladin apart from a LG cleric — different abilities, and different concepts. Clerics are thinkers, and paladins are leaders; clerics truly understand the divine, while paladins understand ideals and people; acolyte paladins spend more time at swordplay than at prayer-study; acolyte clerics split their time more evenly between holy texts and combat training; clerics are devotees of their god, and paladins are devotees of their alignment; the details depend on the DM and players, but the paladin doesn’t need its restrictions to set it apart from other classes. In fact many of us see the cleric as a great precedent for inclusive paladins — why does one class have such a narrow definition when a similar class has such a loose one? (We know the historical reasons, by the way; it’s a rhetorical question.) It’s terribly asymmetrical and inconsistent! So just how inclusive is the inclusive paladin? Different inclusivity advocates advocate different degrees of inclusiveness. ‘Any Good’ and ‘any alignment’ are common, while ‘any Lawful’ is not unheard of; it depends on the individual’s perception of what it means to be a paladin. Yeah, but have you actually tested the inclusive paladin in play? Why yes, many of us have DMed and played inclusive paladins, which is how we know that they’re good harmless fun! Wouldn’t eight paladin-like classes be better? Arguably, yes. If we had eight more ‘exemplar’ classes for each alignment, many of us would probably find it an acceptable compromise to leaving the traditional paladin as-is. Unfortunately, not many gamers are up to the task. In Dragon #310 and #312, James Jacobs wrote eight paladin-like classes for the other alignments, and even he wasn’t satisfied with the result! (Probably because he himself is a paladin traditionalist, and wrote the classes just to fill page space.) The fact is, most inclusivity advocates are just as happy with a single inclusive paladin class, and traditionalists generally aren’t passionate enough about other ‘exemplar’ classes to actually write them well. There’s also the logistical problems — limited page space and printing costs make nine ‘exemplar’ classes very impractical. Maybe someday, in an age of all-digital D&D, a D&D design team with the passion and the know-how will accomplish this feat of creativity; but until then, a single inclusive paladin class is the best solution. But isn’t the paladin based on Saint George, the Knights of the Round Table, the Knights of Charlemagne, etc.? Some of them, yes, though the gamers who site these legendary figures often misunderstand them. More importantly though, inclusivity advocates just don’t care who Gygax or Arneson were thinking of when they made the paladin. We’re thankful that they invented this incredible hobby, but we know that the paladin is more fun our way! Isn’t the paladin defined by a devotion to Goodness, honor, the Code, etc.? Definitions can and do change; D&D’s history is filled with examples, but I’ll save those for another article. The short of the long is that inclusivity advocates recognize the paladin’s traditional definition without feeling beholden to it. Doesn’t the paladin’s restrictions help make D&D different than similar games? This is arguably true, but irrelevant to an inclusivity advocate. Even if the paladin’s restrictions were the one thing separating D&D from other ttrpgs, a fun game is better than a unique game. For example, I myself like alignment. Admittedly I find the Law vs. Chaos axis fuzzy and not terribly inspiring, but I love the idea of a world where certain things are objectively and inarguably Evil, and where the game universe itself recognizes those who fight the good fight! Don’t inclusive paladins cheapen the alignment scheme, and turn it all into white hats vs. purple hats vs. pink hats, etc.? Welcome to D&D! Our game has a long and honored tradition of turning alignments into football teams. See: the Great Wheel cosmology, the cleric class, etc.. But other classes have restrictions; why don’t you care about those? Actually, most of us find those restriction equally silly, for similar reasons. The paladin just gets more press because it’s the poster child of arbitrary traditional restrictions. For example, I myself am happy with cleric-like restrictions because they’re reasonable and not overly specific or prone to debate. But that ‘rangers must be Good,’ ‘barbarians can’t be Lawful,’ ‘thieves can’t be Lawful Good,’ and other malarky? Those all get ignored in any campaign I DM. If there were a great demand for inclusive paladins, wouldn’t we have them? If you’re asking this, you’re part of a very insular gamer community. Aside from the potential for confirmation bias and other psychological factors that you’re ignoring, 4e and 5e have already demonstrated that the demand is enough to make inclusive paladins core. Yes, there’s a whole new generation of D&D gamers who think that alignment restrictions are as bizarre as you think inclusive paladins are!